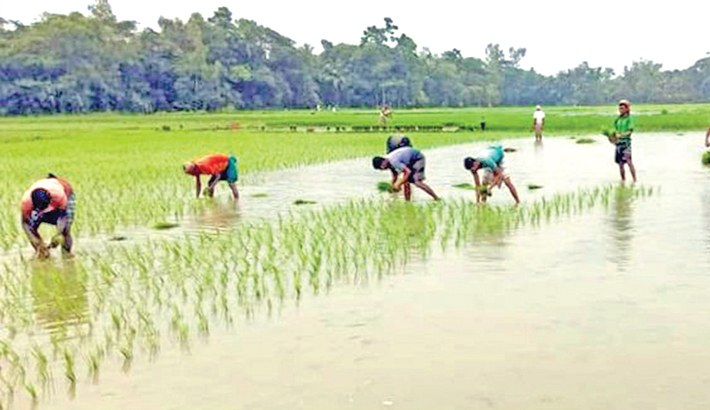 NILPHAMARI: The farmers are passing busy time for transplantation of Boro seedlings going on in full swing in Nilphamari district in this season for the cultivation of Boro paddy due to the suitable soil, favourable weather conditions and timely supply of necessary agriculture inputs. The Department of Agriculture Extension (DAE) of the district organised more training programmes and conducted campaign for using organic fertilizer before cultivation. The farmers expressed their optimism about bumper production of Boro cultivation. Farmer Rafiqul Islam, 43, son of late Azizar Rahmman of Fakirganj village under Sadar upazila in Nilphamari said, “This year I have cultivated Boro on one acre of land which costs Tk 8 thousand”. Another farmer Shanti Pada Roy, 45, son of late Tara Pada Roy of Khokshabari Jele para village under Sadar upazila of the district said, “I received more training about Boro cultivation while the DAE office arranged different training programme and expressed about easier process of cultivating Boro paddy. So this year I have cultivated of Boro on two acres of land. I hope sufficient production of the paddy in this year”. “This year the Boro cultivation target is 81,613 hectors of land. A total of achievement 800 hectors of land till now”, the DAE Deputy Director of Nilphamari Md Abul Kashem Azad told this correspondent. “We hope the target has been exceeding due to the favourable weather conditions and timely supply of necessary agriculture inputs”, he added. While contacted Kamal Kanti Barman, Senior Assistant Director of Bangladesh Agricultural Development Corporation (BADC) in Niphamari said the BADC supplied high yielding variety seeds at a fair price among the farmers of Domar, Dimla, Jaldhaka, Kishoreganj, Syedpur and Sadar upazila of the district.